Gunnison sage-grouse once ranged widely across southwest Colorado and Utah but today they occupy just 10% of their historic range. With fewer than 5,000 of these birds remaining the Gunnison sage-grouse needs our help. Habitat loss from urban development, oil and gas drilling, mining, off-road vehicle use, and road construction threatens to push this species toward extinction. In 2014 the Gunnison sage-grouse was listed as a threatened species under the Endangered Species Act. Visit our #StandWithGunny page to take action and protect Gunnison sage-grouse habitat. In 2014 the Gunnison sage-grouse was listed as a threatened species under the Endangered Species Act. The listing decision spurred several lawsuits. On one side, conservation groups argued that the species deserves “endangered” status, rather than “threatened.” On the other side, the State of Colorado and State of Utah, as well as a Colorado ranching group pushed back against the listing altogether! On September 28, 2018, a Federal judge upheld the endangered species list protections for Gunnison sage-grouse! The judge upheld the decision by the US Fish and Wildlife Service to protect the Gunnison sage-grouse as a threatened species and to designate more than 2,200 square miles of land as critical habitat. Rocky Mountain Wild is working to secure habitat protection through land planning processes at the BLM level including the Gunnison Sage-Grouse Rangewide Resource Management Plan, and the Tres Rios Resource Management Plan Amendment. When the Gunnison sage-grouse was listed as a threatened species in 2014 it triggered the BLM to undertake a range-wide Resource Management Plan Amendment to provide a framework for protecting and restoring the species and its habitat. Through this process the BLM is reviewing its management of over 600,000 acres of sage-grouse habitat. A draft plan, released in August 2016, did not provide adequate protection for the species (see our press release here). We have submitted detailed comments on this and are waiting for the final plan to be released. Rocky Mountain Wild nominated the Dry Creek Basin and Northdale areas for ACEC protection in 2007. Due to a procedural oversight, the BLM failed to consider protection of these areas in their 2013 Resource Management Plan. We protested, and in 2015 were notified that the BLM must evaluate these parcels for ACEC designation. RMW provided the BLM with detailed comments on theses parcels, and in the summer of 2017 we were notified that the parcels meet the criteria for ACEC designation. On February 20, 2019, The BLM released its draft Tres Rios ACEC amendment, which again failed to consider our ACEC nominations. 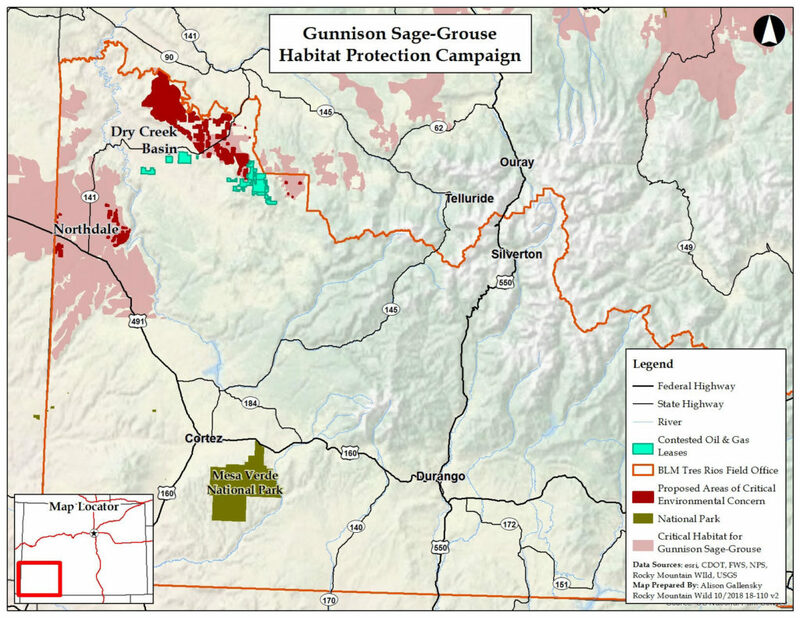 Instead, the BLM is proposing to review these are part of the Gunnison Sage-Grouse Rangewide Resource Management Plan, which has no scheduled date for completion. In the meantime, development continues to encroach on this important habitat.